Now that the Australian Marine Parks have been finalised, the Australian longline fishery is looking to invest significantly and develop opportunities. One company in Australia’s eastern tuna and billfish fishery making a major investment in the fishery is Klokan Fishing based in Port Stephens, New South Wales. ‘The Australian Marine Parks process has been ongoing for 20 years and has stifled investment,’ said David Ellis, Tuna Australia CEO. 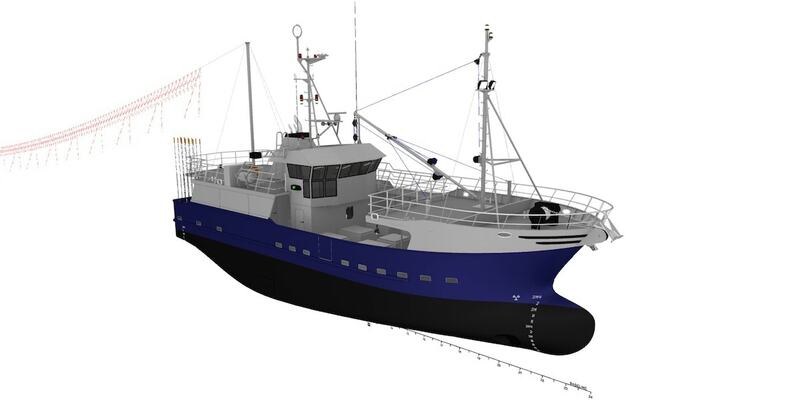 This family company is building a state-of-the-art new-generation fishing vessel, which owner John Skoljarev says is part of a move to harness growing confidence and opportunities in the fishery. ‘The 24-metre longliner will be fuel-efficient, safe and stable and will have a large capacity to hold fuel, brine, live bait and ice. This boat will greatly enhance our business operations,’ he said, commenting that the initial boat design is based on his experiences with previous vessels and after speaking with people in the industry about the pros and cons of their boats. John Skoljarev commissioned naval architects Jon Kemp and Sam Stevens of Oceantech in Adelaide to develop the design to meet Australian Maritime Safety Authority requirements. After a year and a half, the result was an efficient design for an aft wheelhouse displacement hull. ‘The boat has a relatively narrow hull for its length to help gain fuel efficiency,’ he said. Construction started this month on Kooragang Island, Newcastle, where CTB Industries are building the hull. ‘The hull is being built upside down, after which it will be flipped over onto the keel and the wheelhouse will be put on,’ John Skoljarev said. 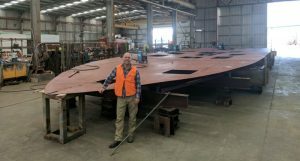 The hull is expected to be complete by the end of 2019, after which the boat will be moved from the Kooragang workshop to the Port Stephens wharf for fit-out, which is expected to take as much as a year and a half.